I love lentils. My favorite pasta when I was growing up was the pasta e lenticchie (Pasta and Lentils) Angelina made. Rice goes as well with lentils as pasta does, and it’s even easier to make. A one-pot dish that makes a perfect first course before a wintery stew or roast, Rice and Lentils is hearty enough to serve as a weeknight dinner on its own. And it’s a great way to use up those leftover lentils from New Year’s Eve. Start by making a soffritto: Sauté the pancetta in the lard or olive oil until it has rendered much of its fat and is just beginning to crisp. Add the onion and continue until the onion is soft and translucent, taking care not to brown it at all. Then add the garlic, give the soffritto a turn. If using tomatoes, add them now, and let them simmer until they melt into a little sauce. As soon as the garlic begins to give off its aroma, add the pre-soaked lentils, which you will have rinsed under cold water and drained very well. Mix the lentils and soffritto well, and let the lentils simmer for a few minutes to absorb the flavors. Add the rice and a couple more ladlefuls of water or broth to the pot. Give it a stir and cover again, let the rice simmer until tender, about 10-20 minutes depending on the variety. Once again, stir from time to time and check to make sure things aren’t drying out. Rice, like lentils, absorbs quite a bit of liquid. Adjust the amount of liquid to suit your tastes—the dish can be quite brothy if you like, but is usually served thick, more stew than soup. Serve your Rice and Lentils hot, with one or more of the suggested toppings if those who like them. If making this dish with leftover lentils, you can simply add them to the soffritto and cook for a minute or two to meld flavors before adding the rice. Indeed, many (if not most) recipes for Rice and Lentils call for cooking the lentils separately and then adding them to the soffritto; I’ve opted here for the one-pot method. If the lentils are already savory, you can even skip the soffritto altogether and just warm them up and add the rice to cook until done. 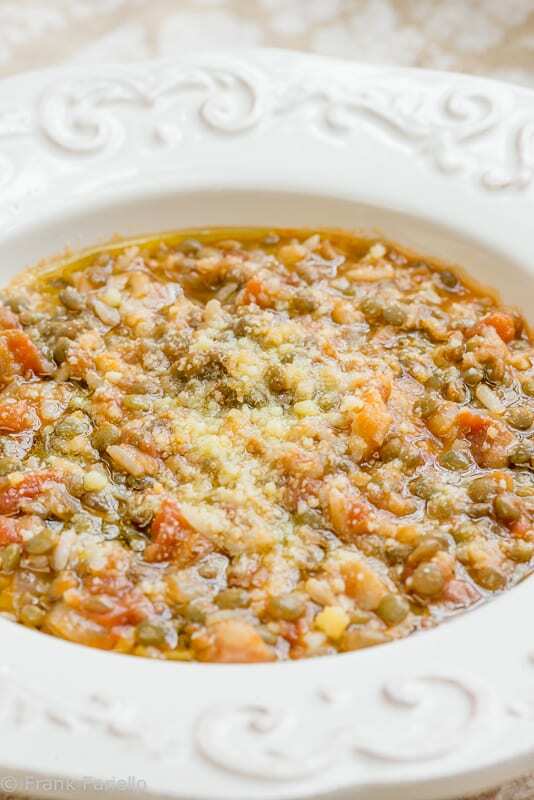 In Italy, the lentils from Castelluccio in Umbria are famous and if you can find them, would be marvelous in this soup. I also very much like French lentils, which are much easier to find. Both of these varieties are particularly prized because unlike most lentils they retain their shape even when they are perfectly tender. But Rice and Lentils being a soup/soupy pasta dish, you can really use any old lentils you want, including the usual brown lentils that tend to disintegrate when you cook them. Not all lentils need to be soaked—Castelluccio lentils are one well known example—but for most varieties I find it helps both shorten cooking times and prevent disintegration. The rice for your Rice and Lentils could be one fit for risotto, but, to my taste, a longer grain rice would be better. In fact, you can use or just about any variety of rice you like, although I would avoid a very delicate rice like basmati, which would likely turn mushy in a dish like this one. Rice and Lentils is not a bad way to use leftover rice, either, by the way, assuming it’s plain boiled rice, like the kind you get from Chinese take-out. (There are other, better, uses for leftover risotto, on the other hand, which I hope to blog about in the near future.) Just add the rice to the cooked lentils, mix well and let simmer for just long enough to heat the rice through. Serve immediately. As mentioned, Rice and Lentils is equally nice made with or without tomato according to your mood. The soffritto can vary, too, according to your taste; many recipes (perhaps most) call for celery as well as onion, and you could go for the typical ‘holy trinity’ of onion, celery and carrot. Being a lentil maven myself, most of the time, I want the pure taste of lentils to come through and omit the tomato and keep the soffritto simple. The measurements are equally variable; use more or less lentils or rice as suits your taste. Personally, I like a 1:1 ratio of lentils to rice, but many recipes call for a bit less rice than lentils by weight. You can turn this dish vegetarian by omitting the pancetta and using olive oil instead of lard; you can make it vegan by omitting the cheese topping. Add the rice and a couple more ladlefuls of water or broth to the pot. Give it a stir and cover again, let the rice simmer until tender, about 10-20 minutes depending on the variety. Once again, stir from time to time and check to make sure things aren't drying out. Rice, like lentils, absorbs quite a bit of liquid. Serve hot, with one or more of the suggested toppings if those who like them. THANK you Frank, for a truly amazing, authentic dish! Enjoy, John! I recently used that soaking in salted water to make pasta and beans. It was delicious! I know you don’t need a play-by-play on but the aroma of the riso e lenticchie on the stove makes both Mark and me feel like we are back in Italy. Can’t wait to dig in! Used 2:1 French lentils to Carnaroli rice, just because that’s what I had. Added some salt. Came out perfect. Used French lentils and much too fancy Carnaroli rice, cause that’s what I had. I find that the Castellucio lentils require no precooking whatsoever and do precisely as you recommend. This dish is a natural segue after the traditional New Year pot of lentils. The forecast being unseasonably cold, I may prepare Rice & Lentils over the weekend. This is the season for lentils, Paula. Happy New Year! I love lentil soup and have cooked many different variations but never used Italian lentils or soaked the lentils. Trying this recipe will be a new experience. Thank you! Thanks, Gerlinde. If you do try it, let us know what you think. Frank – for most of the 22 years Mark and I have been together, he was unable to eat most legumes for health reasons. Since moving to Arizona, his health improved 100% and now that boy cannot get enough of them, especially lentils and chickpeas. I plan to make this for us for our Sunday evening supper – will report back! Thanks for introducing me to a new vehicle for lentils! Great, classic dish. I sometimes make a variant of this, usually skipping the pancetta and tomatoes. I sometimes add a bit of ham base to water if I want a bit of a “meaty” flavor. I often make mine in one pot too. Although sometimes I just start the lentils, then wait 15 minutes or so to cook the soffritto in a frying pan. And then scrap the contents of the frying pan into the lentils. My thinking is the ingredients in the soffritto retain more flavor in the finished dish that way. Probably not a concern with a lentil dish, since lentils cook so quickly, but something to think about with other bean-based dishes. One other thing: I never soak my lentils (because they cook so quickly). I just sort through them, rinse them, and then cook them. I’d guess soaking makes them cook a bit faster. Any other benefit to soaking them? I’ve gotten to the point where half the time I don’t soak beans (overnight) either — just sort and rinse, then simmer. Although of course it takes about twice as long to cook them. I don’t *think* there’s much difference in finished texture, although part of me wants to think the soaked ones are creamier and more tender. I don’t always soak lentils, but I do find that since soaked lentils need less simmering time, they tend to retain their shape a bit better. Which, for a soup, doesn’t really matter all that much, admittedly, but they are much more “bloggable” that way. 😉 I sometimes soak overnight in cold water, sometimes using the quick method of bringing them to a boil, then turning off the heat and waiting for an hour. I’ve never tried to one hour soak in salted water, but it sounds intriguing. I was raised on the notion that salting legumes makes their skins tough, but I understand that’s been debunked. The recipe is comforting me by just looking at it. We don’t have the Italian lentils but red split lentils instead. I’m going to experiment with them and see how they turn out. Can’t wait to make the recipe. Buon weekend, Frank. Thanks Marisa Franca! Do let us know how it turns out. Happy New Year to you, too, Paola! So wonderful!!! Reminds me of my gram❤ Gonna have to make it now … thank you! And thank you, Karen, for your kind comment! Love it when I can remind people of their roots. I make pasta and lentils (with lentils from my home region), but never tried rice and lentils. I find lentils quite comforting in the winter. Love the combo of rice & lentils…Julia della Croce has a great soup recipe in her “Umbria” cookbook. I have never seen the Castelluccio lentils here in Vancouver…end up buying them in Italy and stashing them in the luggage…I think they are my favourite even though Dupuy lentils are very good. I will be on the lookout for the ones from Abruzzo now! I never order stuff from the States on-line, it’s just too crazy $$ and a big pain! dal mio recente viaggio in Umbria ho portato un pacco di lenticchie di Castelluccio, sono impareggiabili anche se piuttosto costose , dato che ne ho ancora un pò, mi segno questa ricetta, è perfetta per le giornate umide che abbiamo qui adesso ! Buon fine settimana Frank ! Frank – That does look like a delicious, comforting meal and it reminds me that although I cook lentil soup, I’ve never cooked them with rice. Like Domenica, I buy the lentils from Abruzzo whenever I can find them, and there is a good Italian grocery store near me. But if I am in a pinch, it’s easy to find the French depuy lentils too. I forgot about this dish. We are in a true deep freeze – an iceberg really – and this would so comfort me. I have trouble finding anything but the brown lentils in Minnesota but that won’t deter me! Perfect weeknight, warming dish. Hi Frank, as you know I adore soups just like this one. Abruzzo has lentils that are similar to the Castelluccio lentils from Umbria. They have a really nice earthy flavor and hold their shape well. I have never soaked lentils overnight; I’ve always just added them to the pot after sautéing the aromatics. I am guessing that soaking means a shorter cooking time and also that less broth/water needs to be added, which is a nice short cut. Either way, this is a good soup for this bitter cold we’re having. Buon weekend! We’re definitely on the same wavelength when it comes to simple, warming soups like this one. And on soaking, I have to admit, I often don’t either. Don’t always have the foresight to soak and I don’t want to deprive myself of lentils under any circumstances!